THEN: YOU ARE NOT USING SHINES ! For over 10 years, Bill Gothard has proven over and over again that his deer scent works... If you are using a scent cover and the deer can smell you... If the deer don't try to eat bushes and pine cones sprayed with the attractant you are using... You are not using Shines! "As a deer hunter, about 15 years ago I decided to try and make a homemade deer scent. 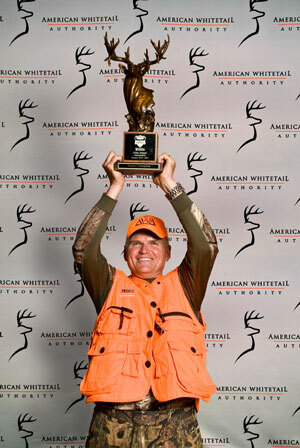 I could not find any other deer scents that worked." "I then began experimenting with White Oak acorns. I took into consideration that it was a deer’s favorite food. It took me about two and half years to get it to attract deer and cover the human odor. The first time I used it, I was with 2 other hunters. One person had a buck trail him to his tree, and the other had a doe lick it off his tree. I started producing and selling it about 12 years ago. It is in stores all over the country... AND NOW YOU CAN BUY ONLINE!" It works all year long. Deer don’t know what time of year acorns fall, they smell them and go find them. It works in all kind of woods, they don’t know what an oak tree looks like, but as I have found out it will also work in a pine forest. All you do is wash your clothes in unscented soap, dry them and store in a plastic bag. Take a shower in unscented soap and use an unscented deodorant spray Shines Acorn Scent all over you before going into the woods. After you get up into your tree stand spray again and deer cannot smell you at all! 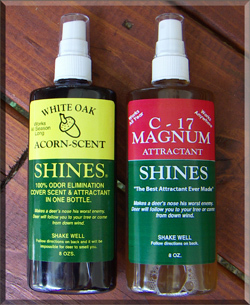 For website problems email webmaster@shinesscents.com ©2007 Shines Scents. All Rights Reserved.